If you are looking for a great family vacation destination, look no further. The Waterscape Resort condominium complex is one of the area’s most luxurious beachfront complex’s with three beautiful community pools, a waterfall and lazy river, barbecue grills and two hot tubs. There’s a playground for the kids and the beach access is handicapped accessible. After the long days at the beach, head to Stewby’s Seafood Shanty or Floyd’s Shrimp House for a delicious seafood dinner. 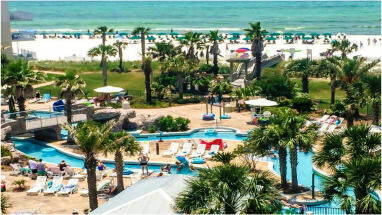 We hope you are able to come to enjoy the beauty of the Emerald Coast at Waterscape Resort condominiums. The location of the resort is one of the best features. Just west of everything Destin has to offer and in Fort Walton, you get the best of both worlds. Local attractions include the Okaloosa Island Pier, Okaloosa National Mini Golf & Ice Cream, Gulfarium Marine Adventure Park, Wild Willy's Adventure Zone, and Power up Watersports. There is so much to do in this area, a week might not be long enough to do it all! 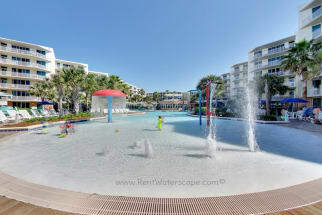 Book your trip to Waterscape Fort Walton with ECBYO.com. These beautiful U shaped buildings offer some of the best views of the Gulf of Mexico and an unrivaled family vacation experience. Our condo owners will gladly help you plan your next get-a-way. 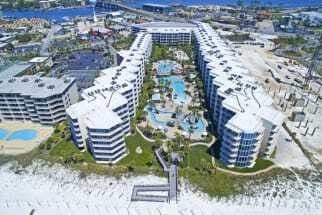 We hope you enjoy your stay at Waterscape Resort in Fort Walton Beach Florida. Watercape A219, Convenient pool level!